A lot has been said in mainstream and social media about the Duron Carter incident over the last week. Some of it reasonable, far too much of it not. I’m not interested in re-hashing each element of the incident or perform a Zapruder film-like dissection of the various TSN broadcast angles. 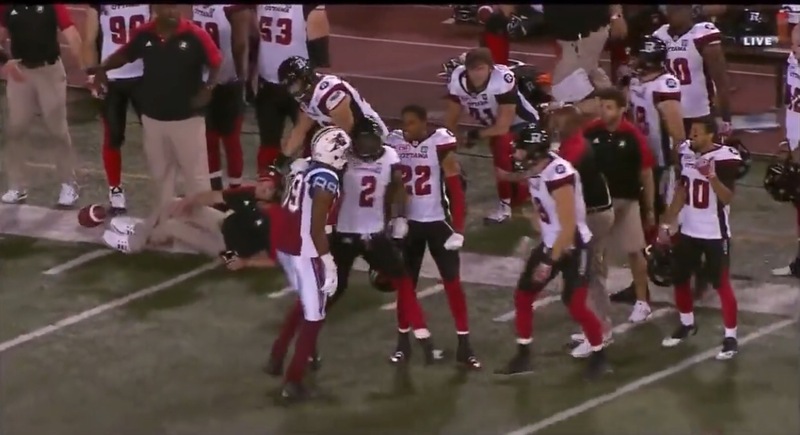 In my estimation, it is all pretty meaningless and does little else than deflect from the only issue of any import or relevance: An opposing player aggressively approached the Ottawa Redblacks sideline and recklessly knocked over head coach Rick Campbell. Was Jermaine Robinson’s hit on Carter after the TD catch dangerous and worthy of a fine? Yes. Should Jerrell Gavins have been fined for punching the back of Carter’s head after he knocked Campbell down? Probably. Was Campbell on the field of play? Of course. Was Carter concussed? Maybe. But all of that is nothing but window-dressing. Missing the forest for the trees. Footnotes to the real story. A player went after an opposing coach. It’s pretty simple: Coaches have to be protected from acts like this. Leagues protect their officials – like the NHL did in the Dennis Wideman case – because they are vulnerable to the much larger, stronger, amped-up athletes they’re paid to look after. Football coaches are very similar in this respect. The end result from the CFL was a single-game suspension for Carter and fines for other members of the Redblacks, including Campbell, which didn’t sit very well him. It’s a real shame the CFL didn’t take the opportunity and send a message to Carter with a suspension in the 2-to-4 game range, especially now that the player has apparently decided to appeal. Imagining a scenario where everyone directly involved in the Carter incident EXCEPT CARTER gets reprimanded by the league is pretty sickening. The league should have seen that coming, too. We’ll see how it plays out. Everyone will have their point of view, and I get that (we can’t all be right ;)). Here are a couple places (from outside of Ottawa) that I believe describe the incident appropriately. Looking forward to putting this whole incident in the rear view mirror. Also eagerly anticipating August 19th, when the Alouettes visit Ottawa.